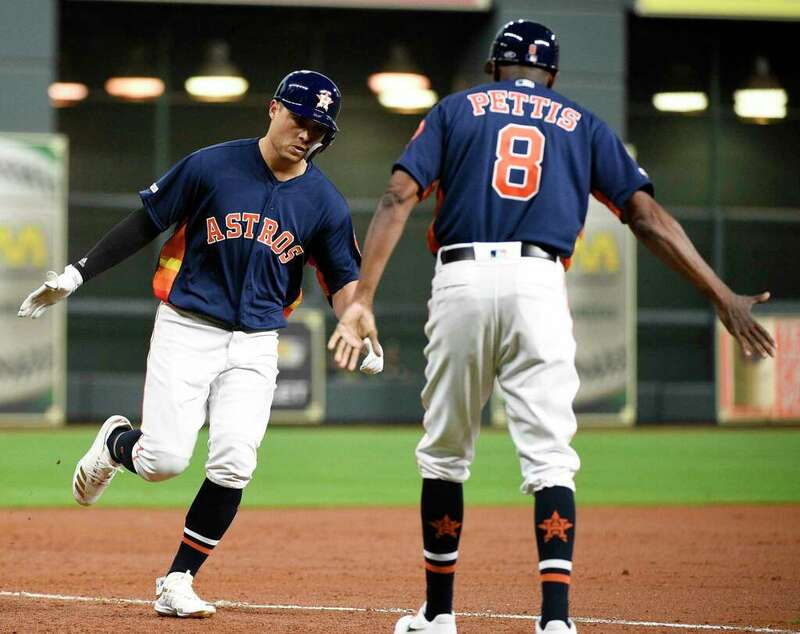 After dropping five-of-seven on the road, the Astros returned to Houston and began their home season with a three-game sweep of the oft-dangerous Oakland A's. Houston won by scores of 3-2, 6-0 and 9-8 as the bats thawed and some late-inning mojo came out. Collin McHugh allowed just three hits and one run over six innings to take the Friday opener. Homers by George Springer, Michael Brantley and Robinson Chirinos backed Wade Miley and four relievers in Saturday's six-hit shutout. Aledmys Diaz had a four-RBI day on Sunday but it was Jose Altuve who drew a walk-off base-on-balls in the ninth for the game-winner after Houston entered the eighth down by two runs. Perhaps more impressive is that the Astros amassed 25 hits in the two weekend contests, signifying that the tepid offense of the first week had vanished. This would seem like a good time for the 5-4 New York Yankees to invade Minute Maid while the Brinks Bombers are somewhat banged up. Justin Verlander (1-0) will pitch Monday's 6:10 pm Central series opener against Masahiro Tanaka (1-0). Gerrit Cole (0-2) challenges Jonathan Loaisiga (0-0) on Tuesday night (7:10 pm Central start) with McHugh (1-1) opposing James Paxton (1-1) in the 6:40 pm Central Wednesday finale. Judging from the start times, I expect at least one of these games will be on national television - good news for out-of-staters. A day off follows then a three-city road trip through the AL West cities of Seattle, Oakland and Arlington. The Astros are back at .500 with a 5-5 mark through Sunday and are in a second-place tie with the Rangers, 3-1/2 games behind the Mariners. Backups played key roles on Sunday as Diaz and Tony Kemp each went deep. The catchers, Chirinos and Max Stassi, are both below the Mendoza line in the early going. Tap those slippers, Dorothy. There's no place like home.